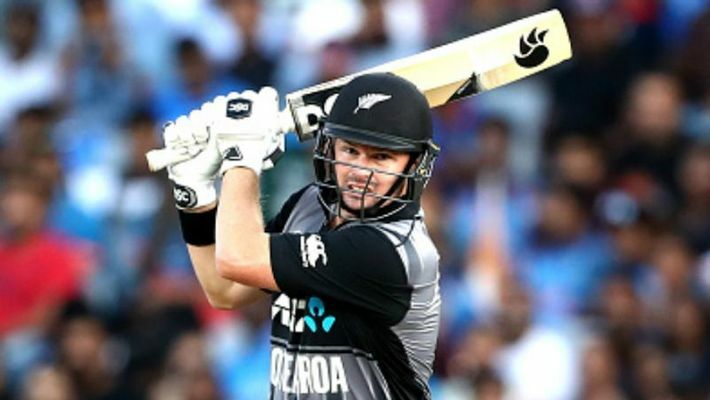 Hamilton: Exploiting batting friendly conditions at a small ground, New Zealand cut the Indian attack to shreds to post an imposing 212/4 in the series-deciding third Twenty20 International, here on Sunday. Opener Colin Munro produced a 40-ball 72 and shared a 80-run stand with fellow opener Tim Seifert (43) to lay foundation for a big score after India captain Rohit Sharma elected to bowl. Runs came thick and fast as skipper Kane Williamson contributed 27 and Colin de Grandhomme produced a crucial 30-run cameo off 16 balls. Krunal Pandya proved to be the most expensive bowler of the lot as he bled 54 runs in his four-over quota. The left-arm spinner was guilty of bowling full length deliveries, which were easier to attack. If it was not for left-arm Chinaman Kuldeep Yadav’s (2/26) tight bowling in the middle-overs and Bhuvneshwar Kumar (1/37 in 4 overs), India would have got a bigger target to chase. The pressure of dot balls prompted Seifert to go after Vijay Shankar. He went for a big hit but edged it towards third man region where Vijay Shankar made a valiant effort but just fell short as he could just touch the ball. The Kiwis though did keep a very healthy run-rate, racing to 50 in just 5.2 overs when Munro heaved one off Krunal for a huge six and followed it up with a boundary on the off side. Krunal bled 20 runs in that over. Seifiert, who paddle swept both pacers and spinners with ease, lofted Hardik for a six over long off. Indian bowlers had conceded 79 runs in first seven overs when captain Rohit Sharma brought Kuldeep Yadav and the leg-spinner straight away made an impact, by getting Seifert stumped with Dhoni's lightening quick hands at work.